You will earn 20,369 Reward Points. Earn 1 reward point for every 1 dollar spent. 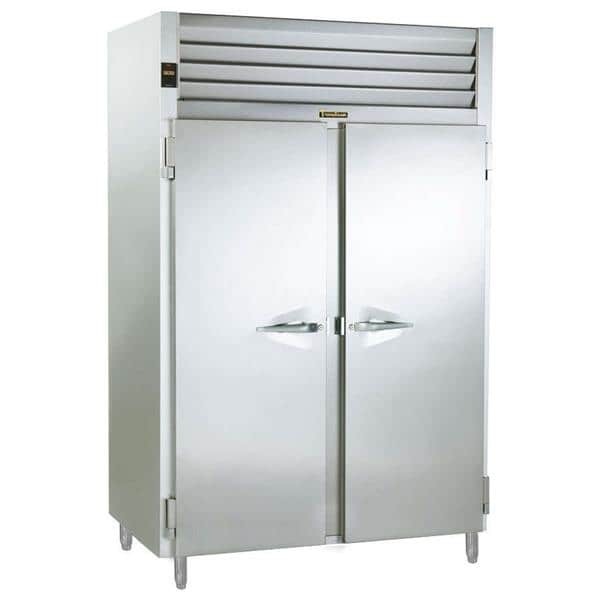 Cabinet exterior, interior, louver assembly and doors are constructed of stainless steel. The exterior cabinet top, back and bottom are constructed of heavy gauge aluminized steel. On roll-in/roll-thru models the interior floor and exterior bottom are constructed of stainless steel and insulated with 3⁄4" of resilient cork (a readily attachable stainless steel ramp is also provided). A set of four (4) adjustable 6" high stainless steel flanged legs are included to provide for secure mounting to the floor (reach-in/pass-thru models only). Doors are provided with locking hasps and equipped with a gasket protecting metal door pan (reach-in/pass-thru models only), removable plug cylinder locks and guaranteed for life cam-lift, gravity action, self-closing metal, glide hinges with stay open feature at 120 degrees. Hinges include a concealed switch to automatically activate the interior incandescent lighting. Guaranteed for life, work flow door handles are mounted horizontally over recess in door which limits protrusion from door face into aisleways. Safety screws are used throughout the cabinet in order to prevent removal with anything but a very specialized tool. Easily removable for cleaning, vinyl magnetic door gaskets assure tight door seal. Anti condensate heaters are located behind each door opening (refrigerator & freezer models only). Both the cabinet and door(s) are insulated with an average of 2" thick high density, non-CFC, foamed in place polyurethane.